A stunning tribute to the lifelong friendship and collaboration of Salvador Dali and Walt Disney. 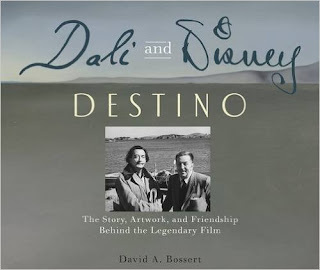 In 1945, the two began working on a project together, intended to be a short animated film called Destino. Dali partnered with Disney Legend John Hench to storyboard the film, but production was brought to a halt because of financial difficulties. Over fifty years later, Walt's nephew Roy E. Disney decided to give it new life. The film went on to be nominated for an Academy Award in 2004 . This volume showcases all 150 pieces of art created by Dali and Hench. Also, the sole piece of animation art that was filmed in 1946 is showcased in a series of images explaining how it was digitally cut apart, restored and then reassembled for the 2003 completed film version. DAVID A. BOSSERT received a B.F.A. in Character Animation from CalArts School of Film in 1983. Mr. Bossert has been with the Walt Disney Company for nearly 30 years. He has served as a Producer, Director, Associate Producer, Artistic Coordinator, Visual Effects Supervisor and Effects Animator on various films and is currently serving as the Creative Director & Head of Special Projects at Walt Disney Animation Studios. His previous book, Remembering Roy E. Disney was published in 2013. 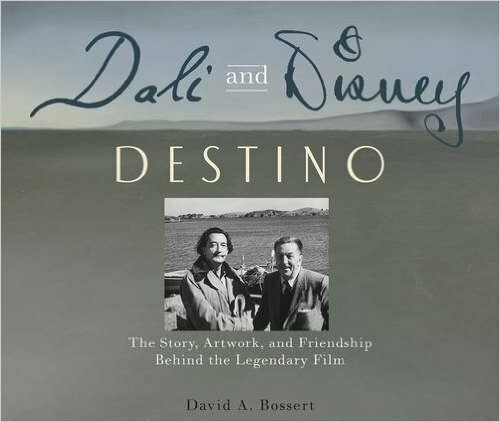 Dali & Disney: Destino: The Story, Artwork, and Friendship Behind the Legendary Film by David A. Bossert is an amazing book on the lifelong friendship of Salvador Dali and Walt Disney. This book is amazing! It's filled with 150 pieces of artwork created by Dali and Hench. It also includes images explaining how it was digitally cut apart, restored and then reassembled for the 2003 completed film version. This is a must have book for any Dali and Disney collector and would make a beautiful coffee table book and conversation starter. Very beautiful book! You can find Dali & Disney by David A. Bossert on Amazon, Barnes and Noble and other bookstores.